The California State University Louis Stokes Alliance for Minority Participation (LSAMP) Program Recognizing Outstanding Undergraduate Distinction (PROUD) honored two San Jose State students and two alumni in its most recent edition. The publication summarizes the work of the LSAMP program statewide to support underrepresented minorities in pursuing degrees in STEM while also acknowledging outstanding scholars at each CSU campus. Fauna Yarza, a biological sciences student with a concentration in microbiology, received the Outstanding Academic and Research Award. She works with Professor Elizabeth Skovran as an undergraduate research assistant. 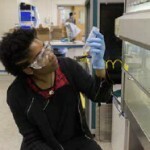 She is studying a bacteria that has the potential for use in biofuels and biodegradable plastics and presented at the Annual Biomedical Research Conference for Minority Students last year, where she won an award. While working in the research lab, she has maintained a 3.75 GPA in her courses and plans to pursue a doctorate in microbiology. Cynthia Ouandji, a biomedical engineering student, also received the Outstanding Academic and Research Award. 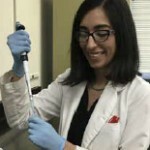 She works in a microfluidics lab and is a member of the Tau Beta Pi Engineering Honor Society. She has pursued multiple research projects including one that involves synthesizing a cost-effective silver-based antimicrobial compound. In 2015, Cynthia was one of ten students accepted into the Summer Program Undergraduate Research in the Life and Biomedical Sciences (SPUR LABS), conducting research in the Cardiac Computing lab. SJSU alumnus Jose Alvarez, ’15 Biomedical Engineering, received the Outstanding Alumnus Academic and Research Award while Beatriz Camacho, ’15 Biochemistry, received the Outstanding Alumna with a Compelling Personal Story Award. View the full CSU LSAMP Proud publication. San Jose State University professors Sen Chiao, Ehsan Khatami, Kamran Turkoglu, Brooke Lustig and Aaron Romanowsky have received a $900,798 grant from the National Science Foundation (NSF). Their project, “MRI: Acquisition of Hybrid CPU/GPU High Performance Computing and Storage for STEM Research and Education at San Jose State University,” will support the purchase of new equipment that will benefit students. The funding will primarily be used to purchase a high-performance computing (HPC) system to provide faculty and students regular access to a modern, on-campus facility for computational science and engineering research. “As a key hub for STEM fields in the San Francisco Bay Area, this facility will promote the progress of science and engineering, as well as offer a wide diversity of experiences for our students, through required laboratory courses and research opportunities,” said Chiao, the principal investigator on the grant. The interdisciplinary project includes faculty and students from biological sciences, chemistry, computer science, aerospace engineering, computer engineering, meteorology and climate science, physics, astronomy, mathematics and statistics. The new equipment will add to SJSU’s ability to train students in the fields of biotechnology, pharmaceuticals and information technology. Chiao estimated that more than 200 students a year would benefit from access to the HPC system in STEM-related courses or research. 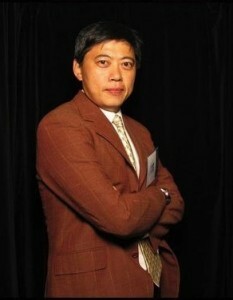 Chiao is the director of the Center for Applied Atmospheric Research and Education (CAARE), funded with another NSF grant. “This new facility will enable many further follow-up projects with CAARE, including cross-disciplinary collaborations as well as participation from the wider SJSU community,” he said. 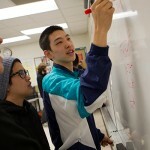 SJSU professors are redesigning lower division math and physics classes that are requirements for science, technology, engineering and math (STEM) majors. For the next four years, several faculty members in the Charles W. Davidson College of Engineering and the College of Science will be working to transform gateway science, technology, engineering and math (STEM) courses with a $3 million grant from the U.S. Department of Education. San Jose State University is one of 18 colleges and universities in the nation to receive a 2015 First in the World grant. SJSU faculty members will work with CSU Los Angeles and Cal Poly Pomona representatives on creating flipped classroom materials that will be piloted at all three campuses. At San Jose State, Provost Andy Feinstein and Associate Professor Laura Sullivan-Green, from civil and environmental engineering, are co-directors on the grant. The first courses that will be updated are Math 30 (calculus I) and Phys 50 (physics I). The classes are a requirement for many STEM majors and a prerequisite for upper division work. 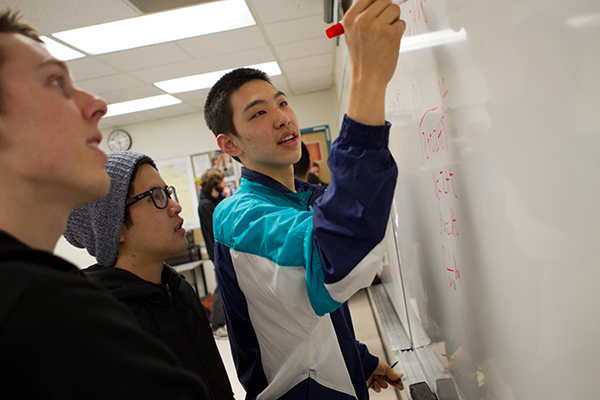 The SJSU team plans to implement the flipped classroom model in fall 2016. Flipped courses often include richer and more readily accessible online supplemental study materials; more elaborate and interactive homework and self-check instructional materials; and more engaging in-class teaching strategies. As part of SJSU’s Four Pillars of Student Success, university leaders are focused on clearing course bottlenecks. Surveys of students revealed that a major challenge to success is course bottlenecks – impasses where they cannot enroll in a course they need to make progress toward their degrees, or when they cannot successfully complete a course and move forward. The university will offer up to 500 additional course sections in 2016-17 to clear bottlenecks. The CSU Chancellor’s Office Proven Course Redesign and Promising Practices grants along with the First in the World grant are targeted at improving successful completion of general education courses that are needed for students to move on to upper division work. “We are hosting faculty and campus coordinators from our two partner campuses the first weekend in June to facilitate community-building and course material development,” said Sullivan-Green, noting that 30 faculty members and administrators are involved between the three campuses in the First in the World Grant. A team of Spartans pedaled hundreds of miles along the California coast this spring to raise awareness about climate change and to support SJSU’s environmental outreach program, The Green Ninja Project. The team included two professors, one alumna, one staff member and three students. Some are avid cyclists, while others were beginning bicyclists when they started training for the 320-mile ride. The team members included Clare and Eugene Cordero, Paul Schmitt, Kelly Chang, Huong Cheng, Ramya Shenoy, Leah Tremblay and Gaby De La Cruz Tello. They raised $25,000 for the Green Ninja Project. The project is an interdisciplinary effort to teach middle school students about environmental issues and sustainability. Roberto Tovar, ’15 Chemistry, is one of four SJSU alumni or students recognized in the October edition of the LSAMP program. Canaan Muluneuh, a chemistry student in his second year at SJSU, was selected for the Outstanding Academic award for SJSU. He has maintained a GPA of 3.83 and facilitated a summer workshop for general chemistry. He is interested in pursuing a doctorate or a medical degree. He is currently involved in research on mosquitoes to minimize populations of the insect to prevent viral transmission. Angel Gonzalez, a third-year mechanical engineering student, was selected for the Outstanding Academic and Service Leadership award for SJSU. He is involved in the Society of Latino Scientists and Engineers and serves as co-vice president. He has been actively engaged with the Science Extravaganza, a one-day event that aims to generate interest in STEM fields for younger students. 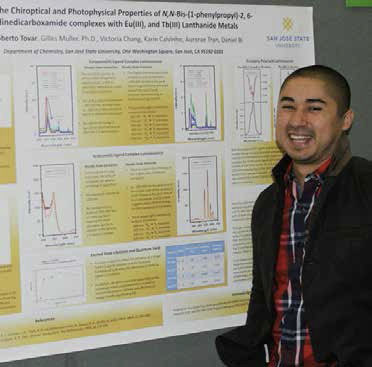 Roberto Tovar, ’15 Chemistry, was selected for the Outstanding Research award at SJSU. Tovar started as an economics major before he took a general chemistry class and discovered he excelled in the field. He was involved with research with Dr. Gilles Muller. His research findings support two poster presentations and a publication in the journal of Tetrahedron Letters. He spent a semester in Germany and since graduation has traveled to France to work at a laboratory in Toulouse, France.